The Crawford Fund is a registered charity which aims to demonstrate the benefits of Australia’s involvement in international agricultural research (IAR), both for our partner developing countries, and for Australia. It also aims to increase the involvement of Australian researchers (and in particular younger researchers) in IAR and runs a training program that has involved Australians in the training of over 12,000 agricultural scientists in developing countries. How did we come to introduce mentoring, an experiential learning process between mature researchers and younger researchers? We recognised the problem of loss of expertise as mature researchers approach retirement, but we also saw an opportunity for mature researchers to mentor less experienced researchers both in developing countries and in Australia. It is part of our long-term intention to make agriculture an attractive career perspective for young scientists, particularly in ‘agriculture for development’, as this has multiple benefits for science both in Australia and in developing nations. Our first support for mentoring involved the placement of semi-retired researchers in agricultural research organisations in two countries much in need of a boost in their agricultural research expertise. I had worked for the Cambodian Agricultural Research and Development Institute (CARDI) from 2004 to 2006 and came to see the value that short-term placement of some senior retirees could bring. Thus, the Crawford Fund supported Professor Graeme Blair and his wife and collaborator Dr Nelly Blair, experienced soil scientists and educators from the University of New England, to spend a number of months in CARDI in 2008, helping the researchers there to improve analytical methods and quality control in their laboratory. Like Cambodia, Timor Leste had suffered a great loss of scientific expertise during the years of war, and we supported a similar placement with soil scientist Dave Lyons in the laboratory at the University in Dili in 2012. 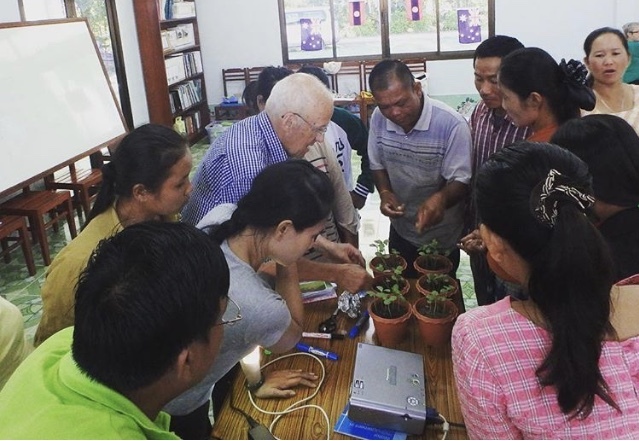 “My first step toward a career in international agricultural research was in 2014 when I went off to Laos as a volunteer entomology advisor as part of the Crawford Fund’s Crop Health Capacity Building Program. I remember landing in Savannakhet and thinking ‘Help! 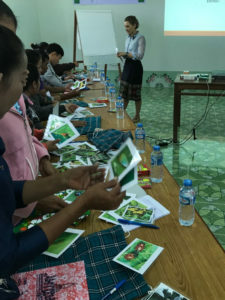 What am I doing?’ But the beauty of this program is the emphasis on capacity building and mentoring, not just with the local staff, but with the many volunteers who are in country working on this program – entomologists, plant pathologists and agronomists. Professor Lester Burgess has played a critical role in the success of this program, in developing sound integrated pest management programs, building the technical capacity of agricultural staff and implementing it on ground. Lester shared his knowledge and skills with me, he introduced me to his key networks, he supported and advised me during my time in Laos and championed me. Four years later, I am currently working as an agricultural entomologist on projects with the Australian Centre for International Agricultural Research (ACIAR) in South East Asia, with a focus on Laos. I still contribute my time to the Crawford Program, and Lester is still my number one mentor. Throughout its 30-year history the Crawford Fund has also sponsored Master Classes where senior Australian scientists have conducted short courses for up-and-coming scientists, mostly in the Asia-Pacific Region. This has all been part and parcel of our long-term aim to boost the capacity of agricultural researchers in the region. Mentoring and sharing information between young and mature researchers is indeed alive and well in the international agricultural research area. With the success of the mentoring model in Laos, we have recently extended the mentoring to programs in Vietnam and Cambodia. Dr Kep Coughlan is a member of The Crawford Fund Queensland Committee. Madaline Healey is a Research Fellow at the University of the Sunshine Coast. You can keep up with the work of the Fund through its website, through its Twitter or Facebook accounts (@crawfordfund) or sign up for our monthly e-newsletter https://www.crawfordfund.org/newsletter/ The Fund is a registered charity and all donations are tax deductible. You can read more about these scholarships on our website, including reports from previous scholars (view the 2016 scholar reports here), a booklet and a video on our YouTube site. This article appeared originally in The Eagle, Vol. 14, No. 1 March 2018, a magazine connecting St John’s Cathedral Brisbane with the community at large.